Some days have boring clouds, or worse yet*, no clouds. Others I call good cloud days, because of the interesting, and often fast-changing, cloudscapes. Here are some of photos of a few of good cloud days I’ve experienced recently. I hope you appreciate the clouds you see, not just for their beauty but for the interesting stories they tell about the past, present and future weather. If you enjoy these or have some of your own to share let me know via the comment link at the bottom of the post. 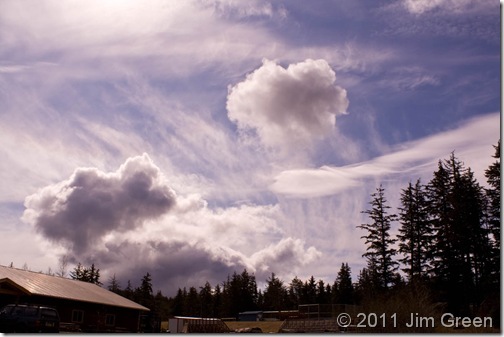 April 13, 2011, Haines. An angry sky of low, turbulent nimbostratus. April 14, 2011, Haines. An unusually shaped pair of lenticular or lee wave clouds produced by strong winds and moisture flowing over the Fairweather Range. 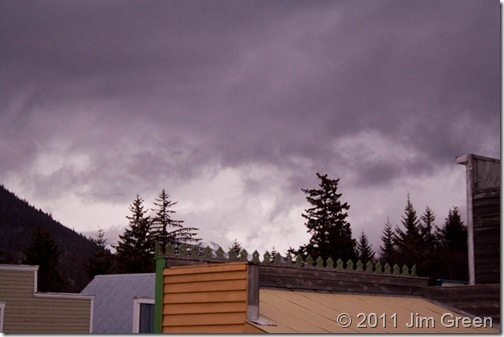 April 25, 2011, Haines. Interesting slanted, narrow cumulus tower. With spring comes warmer land surfaces and therefore a change to more convective clouds, like this cumulus, vs. stratiform (stable, layered) clouds like in the previous two photos. 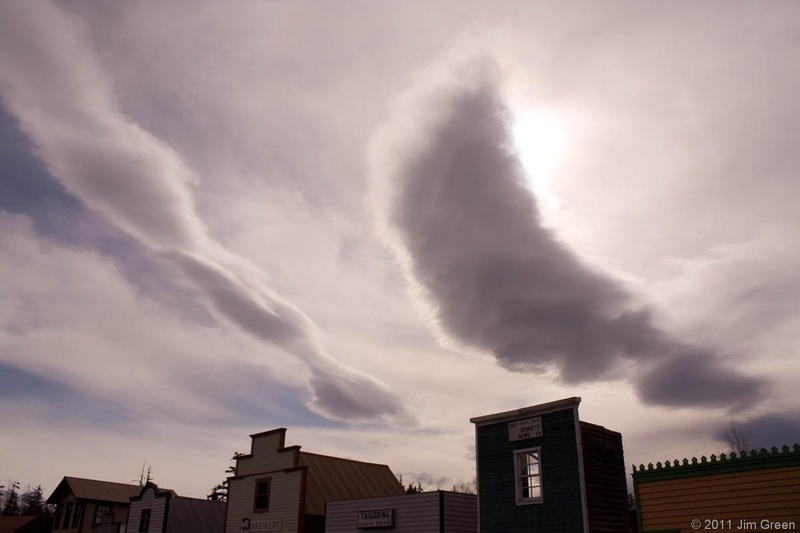 On our mountainous saltwater coast we seem to get a lot of the narrow- and odd-shaped small cumulus. May 7, 2011, Inside Passage just north of Juneau. There are plenty of stratiform clouds in this photo, but over land areas there is enough thermal energy to create some of the small cumulus I mentioned in the previous photo—look at them hugging the island. Its amazing any formed since there is not much solar heating. Note that they are over the mostly snow free slopes of Douglas Island (left of center), but not the snowy slopes of Admiralty Island (right of center). 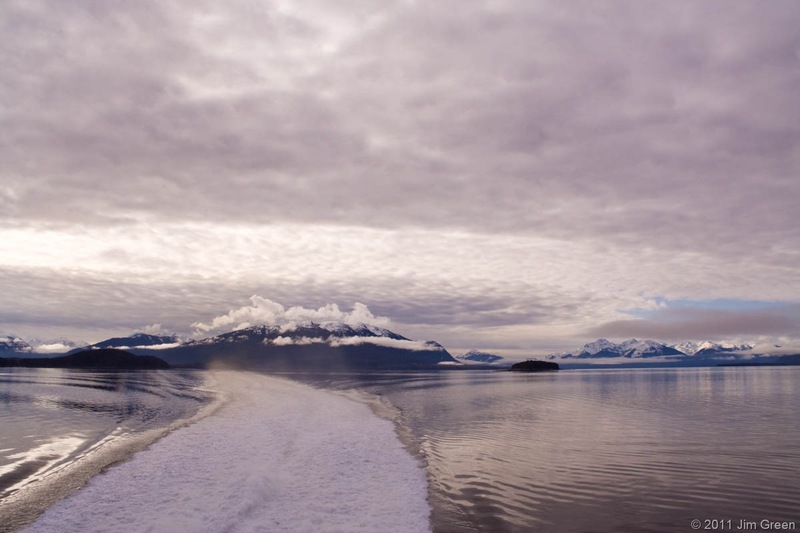 May 7, 2011, Inside Passage north of Juneau, about 20 miles farther north than the photo above. 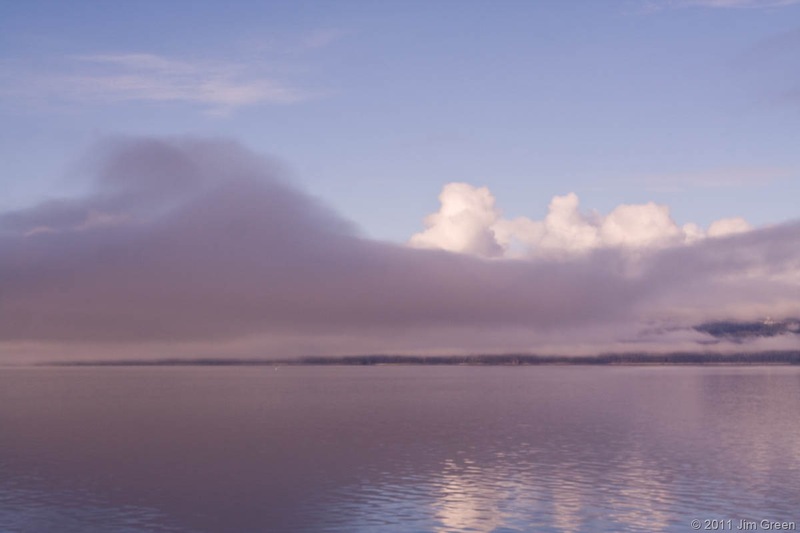 The stratus (left) and the cumulus coexisting—stratus over the water (some on land too) and the cumulus exclusively over the land. The land is warmer and can promote the updrafts needed for the cumulus, while the water is quite cool, but for that reason causes condensation by contact. In early to mid winter the reverse situation is sometimes true: the water is warmer than the air above it causing convection over the water. 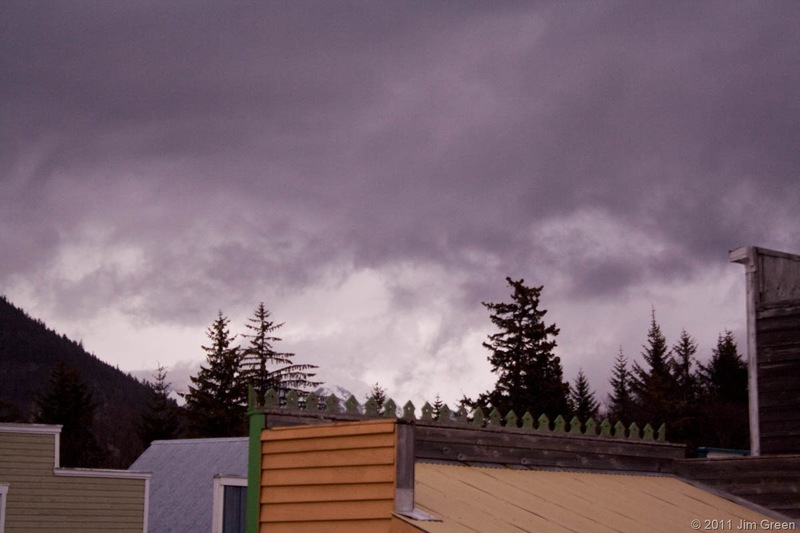 May, 11, 2011, Haines. Another example of convective and stratiform clouds coexisting. In this case the small active cumulus are rising due to shallow thermals off the warm ground, while the much higher lenticular clouds (seen above and a little left of the trees in the right part of the photo — they really are higher even though they are at a lower angle…they are farther away) are in a stable, windier part of the atmosphere above. Higher still are some cirrus clouds. 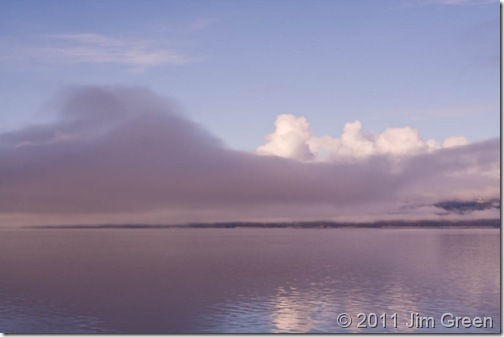 Coming in the next post, a wrap up of the 2010-2011 winter in Alaska. What areas were warmer, colder, snowier etc than normal? Did my winter forecast hold water? check back soon. *OK, I do like a little sunshine now and then, so I suppose no clouds actually might beat boring clouds. 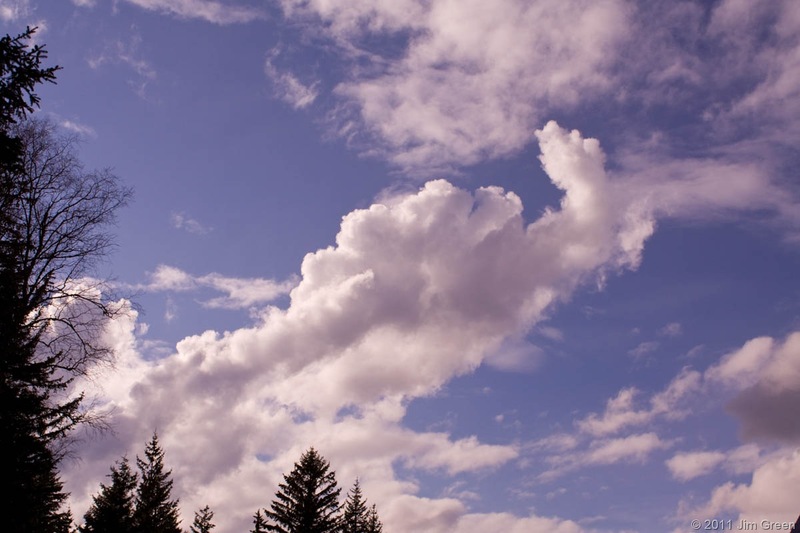 If you can relate to this you might want to join the Cloud Appreciation Society.